, putting in a lot of work can be a challenge (especially if you’re still working). You need about 36 hours in a day – and that just isn’t happening. So, from my wife’s last baby shower, we put together some baby shower thank you wording templates to make it easy to get them done. This way, your husband or friend can easily help you get everything done quickly and easily. Feel free to use these for your own baby shower. The essential part of making writing thank you notes is organization. When you’re actually at your shower, it can be so hard to keep track of everything because everyone wants to chat, and you’re trying to get through a bunch of bags and boxes. Instead, ask the host of the shower, or maybe your best friend or sister, to keep a list of what you get. Then, when writing your thank you notes, you can go right down your list, instead of having to track down all the bags, boxes, and look for cards to remember who gave you what. Thank you so much for the adorable (insert clothing items here). There’s no doubt in my mind that Baby Smith will be decked out in the cutest outfits for the first three years of his life. Your kindness is overwhelming and your support is so appreciated. Thank you again for everything! Thank you so much for the (insert essential items here). It’s a little overwhelming to see how much Baby Smith will need in the first few years of his life, but I’m getting so excited and I’m so thankful to have such a caring group of people to send me into motherhood. Thank you again for everything. A lot of people will simply give you money or giftcards to stores like Babies R Us or similar stores. That is so useful, but it’s sometimes hard to write a thank you note for. Thank you so much for the (Babies R Us) giftcard). I thought I had everything I needed for Baby Smith, but it turns out this little guy has quite a preparation checklist to fill. I really appreciate you thinking of me and thank you again! No matter what, people will stray from your registry, and give you something totally odd. Or maybe Aunt Mae will have made something that you know your baby will never use. Regardless, here’s a catch-all for the random and unnecessary stuff people will inevitably get you. Thank you so much for the (odd item here). I really appreciate you thinking of us and taking the time to (make/find) this for us. I know that it will definitely be useful once Baby Smith gets here. I appreciate your support and thank you again! instead, just remember to personalize them with the baby shower thank you wording above. 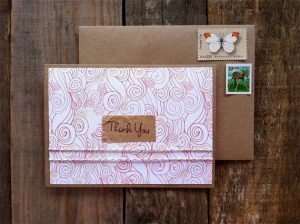 One of my favorite sites for thank you cards is partybell.com. You can find a bunch of other Baby Shower Thank You Cards for extremely reasonable prices on their site. Hopefully, this helps you make the job of writing thank you cards a little easier, especially given everything else going on at this point in time. a good thank you card goes a way when you are then on the other end of things. they’ll likely supply you with a better gift! it’s not just being nice it’s the way around the world!